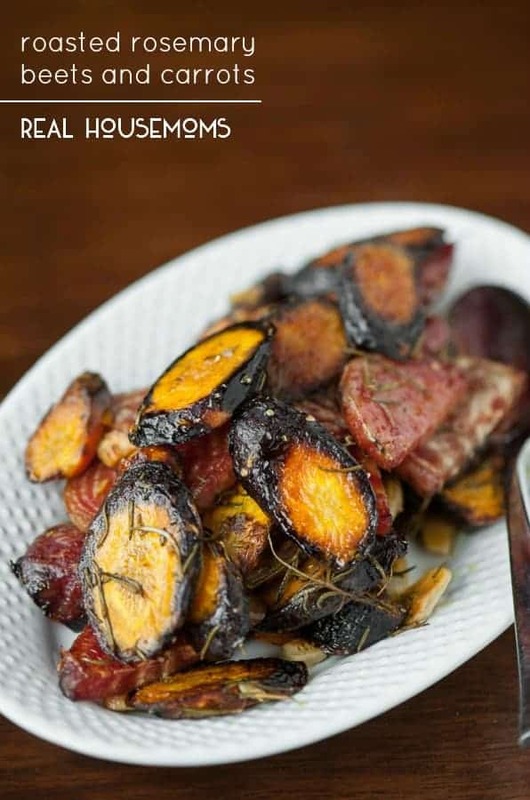 Roasted Rosemary Beets and Carrots are a colorful and healthy side dish, perfect for any fall dinner! I have to admit, pretty vegetables make me very happy. You wanna know something else? Pretty vegetables with a surprise inside make me even more happy. My family loves beets. I’m sure that’s not something you hear every day, but I have kids that will eat a bowl of fresh beet soup, gulping it down leaving a big bright pink ring around their face, and I just smile as I watch them devour these super foods. 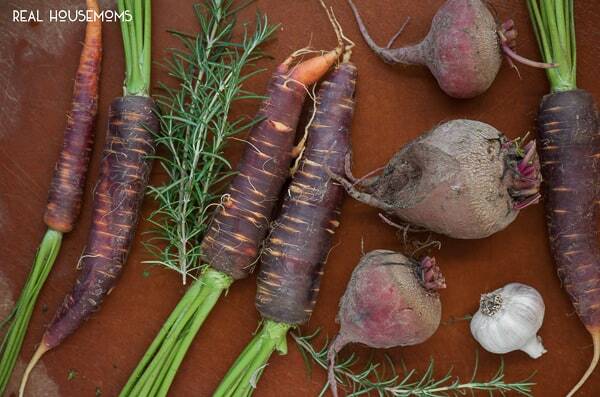 Fall is definitely a time for root vegetables. I mean, who doesn’t eat potatoes, garlic, onions, carrots, beets, radishes, etc. at least every week once summer is over? I got these beautiful veggies at the farmers market. 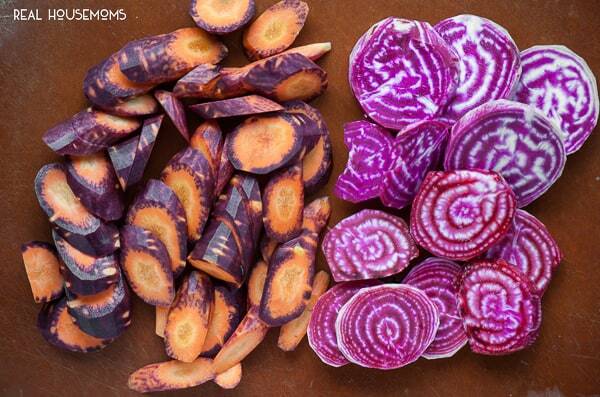 I thought that red carrots would go beautifully with dark red beets for a very monochromatic side dish. Then, I cut into them and it was a color explosion on my cutting board. Just look at how beautiful they are! So, although everything wasn’t dark red all the way through as anticipated, it still roasted up beautifully with the garlic and rosemary. I served these up with a delicious chicken breast smothered in a mushroom and brussel sprout dijon sauce. YUM!!! 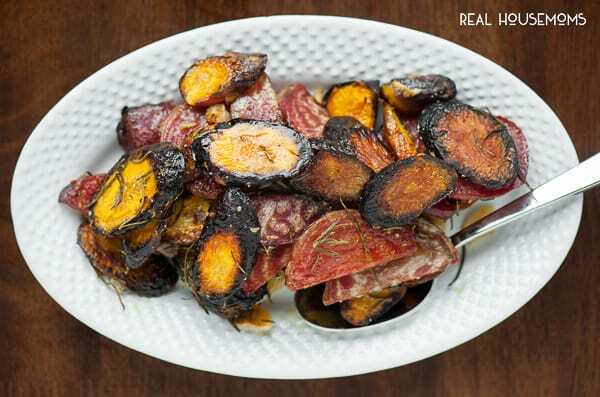 Roasted Rosemary Beets and Carrots are a colorful and healthy side dish, perfect for any fall dinner. 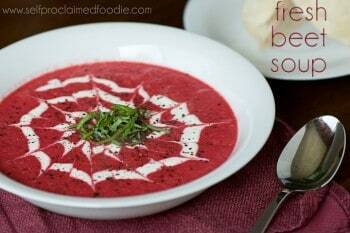 Toss carrots and beets with one tablespoon olive oil in large boil. 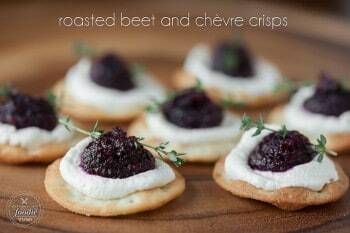 Spread into a single layer on a baking sheet and roast in preheated oven for 20 minutes. 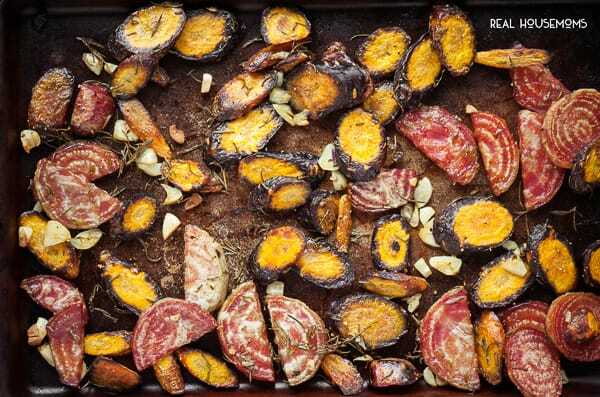 Remove from oven and toss with remaining olive oil, garlic, and rosemary in large bowl. Return to baking sheet and continue roasting until done, about 30 minutes. Add salt and pepper, as desired.